Are you afraid of the people there to protect you? 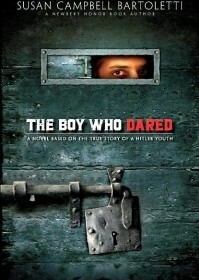 Susan Campbell Bartoletti’s powerful book The Boy Who Dared is a novel about a young boy who stands up to oppression. Helmuth Hubener is a defiant, clever, curious, and brave child. Though he does not have great physical strength, he makes up for it with smart ideas and amazing social skills. His best friend Rudi Wobbe is stubborn and envious of Helmuth’s mental capabilities. Rudi to lacks physical strength but unlike Helmuth is not smart or clever. During the book, the setting switches between Helmuth’s prison cell in a concentration camp and his life before in Hamburg. Both take place in Germany while Adolf Hitler is in control. He had a sheltered life in Hamburg residing in a house next to his grandparents and had lots of books and toys. I didn’t enjoy this book though I see why others would.This is a book for people who have a lot of time to read. While reading this book I had trouble settling in and enjoying it even though the book is not particularly thick. I didn’t enjoy the middle of book because of all the useless filler. For example Helmuth and Rudi start a detective agency where they arrest a man who was accused of murder. Which takes up two chapters and doesn’t move the plot at all. Others however disagree with me and say the man they arrested demonstrated the cruelty of the Nazis that sparked the climax of this book. I think it was Helmuth seeing his priest after being interrogated by the Nazis but you will have to read the book and find out. I disliked how the author would switch between the prison cell and Hamburg so many times in one chapter. This makes it difficult to follow the plot. It would be easier to follow if she would have one chapter in the prison cell and the next be in Hamburg and switch again.